These disposable closures produce a firm, leak-resistant seal for glass and plastic tubes. They will protect samples from evaporation and contamination. They can be easily applied and removed with one hand. 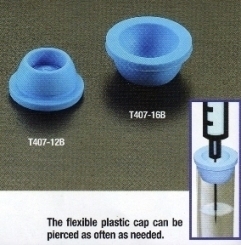 They can be punctured to allow through-cap sampling via closed-tube instrumentation systems. Will not interfere with most common chemistry, coagulation, and drug monitoring methodologies. They can be stored in the refrigerator, in the freezer or at room temperature. They even withstand agitation in a test tube Vortex mixer. Two sizes, 13 and 16 mm fit a variety of tubes including glass evacuated blood drawing tubes. Will also fit 12 mm I.D. cuture tubes. Available in 8 colors for easy identification.